Skirycz A, Vandenbroucke K, Clauw P, Maleux K, De Meyer B, Dhondt S, et al. (2011) Survival and growth of Arabidopsis plants given limited water are not equal. Nature Biotech. 29(3):212–214. At this stage the initial WIWAM xy prototype was largely improved. The hardware programming was optimized and extended with the addition of an RFID scanner, the combination of the weighing and watering station in a single rotating table, and the integration of environmental sensors (light, temperature, and humidity). A completely new graphical user interface was build and the software was backed up by a dedicated database structure. A mature and user-friendly WIWAM platform was born. WIWAM line comprises a pot positioning table, consisting of several individual lines, an underlying portal robot, and one or more stations for imaging or weighing/watering activities. The complete system was implemented in an existing growth room, and was designed to optimally fit the available space. 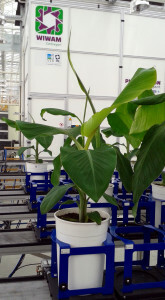 Plants are grown in individual pots, which are picked up by the robotic arm at preset time intervals, bringing them to the imaging and weighing-watering stations. The robot pushes the lines of the table aside to create the required space in between for the robotic arm to locate a pot and lift it out of the table. Images are acquired from different angles by an RGB side view camera, but an imaging station can accommodate a range of camera systems for non-invasive image acquisition. A combined weighing/watering station has been integrated on the robotic arm. Here, plants rotate while watering for an optimal water distribution in the pot. Irrigation precision is very high and goes up to +/- 1 mL. This allows for accurate soil humidity levels throughout the whole experiment. The WIWAM machines are the result of intensive collaboration between machine builder SMO and the Flanders Institute for Biotechnology (VIB). By signing a collaboration agreement both parties join forces in order to make the plant phenotyping technology available for the scientific community. Hyperspectral imaging is today’s technology to reveal the invisible, to generate an in depth understanding of phenomena and objects studied. The technology is used increasingly in many research areas, such as life sciences, vegetation research, forensics, food analysis, and mineral research. In each application area the hyperspectral scanner is used to to identify, measure and map the biological, chemical and physical properties of the objects depicted. Specim technology provides extreme reliability and performance. Measurements can be accurately performed hundreds of times faster than with the competing technologies. In the early 1990’s, thanks to more than 10 years of intensive scientific research done by the VTT Technical Research Centre, the SPECIM Founders designed the first professional hyperspectral spectrographs and imagers. These first commercially available spectrographs were developed in close collaboration with NASA to meet the requirements of the most advanced applications in remote sensing. To this day, in order to reach the high-ends of precision, durability and functionality, SPECIM has been in the forefront with new technological solutions applied to hyperspectral imaging. SPECIM is WIWAM’s preferred partner for the integration of hyperspectral imaging systems in plant phenotying platforms. WIWAM joined forces with Biopute to make the phenotyping platforms available in China. Biopute will provide professional marketing and technical support for the WIWAM products. Furthermore, they will install an after-sales service to make local maintenance support possible. Biopute was founded in 2007 by a group of doctors and masters graduates of China Agricultural University. The company is mainly engaged in products in the field of plant physiology and plant performance, and analytical instruments for soil , water, and environmental analyses. The finalization of the WIWAM Conveyor setup @ VIB was celebrated with an official opening event on October 3rd 2014 in the presence of about 60 people mainly representing politics, universities, and plant biotech companies. The event started with an inspiring talk by Prof. Dirk Inzé entitled “Seeing is believing”, followed by a presentation showcasing the phenotyping platform and the incorporated camera setups by Dr. Nathalie Wuyts. Next, the invitees got the opportunity to visit the WIWAM Conveyor in the greenhouse and to further discuss and reflect during a reception. The official opening also attracted the presence of Belgian television (see movies below (Dutch only)). From February 11-12, 2015, Bayer CropScience organized ‘the Cereal Future Forum’ in Brussels. Around 230 participants from 30 countries joined the 2-day conference on the future of wheat production in the world. The last day, the Cereal Future Forum moved to Ghent for a guided tour at Bayer CropScience and the VIB Department of Plant Systems Biology, UGent. During the visit, WIWAM Conveyor was presented as a new technology to study plant physiology and performance in great detail, while closely regulating soil water humidity and monitoring the environment. All participants were very appreciative after two days of interesting lectures and expert discussions on the upcoming technologies in cereals and new insights into upcoming challenges and approaches. Size control of multi-cellular organisms such as plants poses a longstanding biological question that has fascinated scientists from every time and generation. Currently the question on how size is measured and fixed during growth of an organ or organism is far from resolved, essentially because of its complex, integrated nature of regulation at the cellular, tissue, organ and whole organism level. The state of the art knowledge on the mechanisms that govern plant organ growth and size control was discussed at the symposium in four main topics: shoot growth, reproductive organ growth, root growth, and phenotyping and modeling. About 180 people subscribed for the 3 day meeting with international speakers. The WIWAM plant phenotyping systems were presented at the exhibition area. During summer, the partners of the Phenovision consortium had the possibility to run some test experiments on the WIWAM Conveyor phenotyping platform at VIB. The research group of Prof. Sebastien Carpentier of the KU Leuven performed an initial test to explore the drought tolerance of the various banana (Musa) genotypes at different developmental stages. Furthermore, the group of Prof. Ann Cuypers of the University of Hasselt studied the effect of drought stress on the growth of strawberry (Fragaria) during fruit development and maturation. RGB, thermal infrared, and hyperspectral (VNIR and SWIR) images were acquired during both experiments. Can we predict the final size of maize plants? Although several approaches to identify genes and networks involved in final organ size have been proven successful, our understanding remains fragmentary. The variation in 103 lines of the Zea mays B73xH99 RIL population was assessed for a set of final leaf size and whole shoot traits at the seedling stage, complemented with measurements capturing growth dynamics, and cellular measurements. Most traits correlated well with the size of the division zone, implying that the molecular basis of final leaf size is already defined in dividing cells of growing leaves. Correlation analysis of the transcriptome of growing leaves with mature leaf parameters allowed to identify genes and processes correlated with the specific traits. Untangling complex traits such as leaf size by applying in-depth phenotyping allows to define the relative contributions of the components and their mutual associations, facilitating dissection of the biological processes and regulatory networks underneath. Baute J, Herman D, Coppens F, De Block J, Slabbinck B, Dell’Acqua M et al. (2015) Correlation analysis of the transcriptome of growing leaves with mature leaf parameters in a maize RIL population. Genome Biol. doi: 10.1186/s13059-015-0735-9. https://www.wiwam.be/wp-content/uploads/common/WIWAM-brand-logo-HQ-e1536312465362.png 0 0 Stijn Dhondt https://www.wiwam.be/wp-content/uploads/common/WIWAM-brand-logo-HQ-e1536312465362.png Stijn Dhondt2016-10-17 12:19:122017-06-30 14:54:57Can we predict the final size of maize plants? 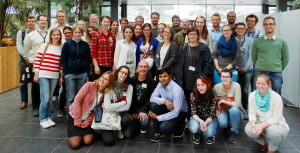 From 13 – 19 September VIB – Ghent University, Université Catholique de Louvain, and Université de Liège joined forces in organizing an EMBO practical course entitled “Insights into plant biological processes through phenotyping” in Ghent, Belgium. This EMBO Practical Course discussed and demonstrated the multiple and diverse aspects of plant phenotyping, covering the cell to whole plant scale, and including growth-related, as well as physiological and performance-related plant traits. A great group of 25 selected participants enjoyed the practical sessions and the talks of 31 international speakers. Through hands-on-experience and interactive demonstrations, the participants obtained the required practical knowledge to perform plant phenotyping in their institutes of origin and have a concrete idea about the requirements and management of simple and advanced phenotyping platforms, in case they require developing or purchasing one themselves. Of course, also the automated WIWAM phenotyping platforms came in the picture. The WIWAM machines are the result of intensive collaboration between machine builder SMO and the VIB (Flanders Institute for Biotechnology).